I like to joke that I discovered this dish. I’d be wrong, but I still like saying it. Back when I was 10 or 11, my mother had made some spicy pollack roe and the leftovers were in the fridge alongside some leftover spaghetti noodles. I mixed the two and decided that was the most delicious thing ever. Fast forward about 20 years and I tried Mentaiko Spaghetti (明太子) for the first time at a restaurant and realized, much to my horror, that this had existed in Japanese cooking long before this Korean ever put it together. 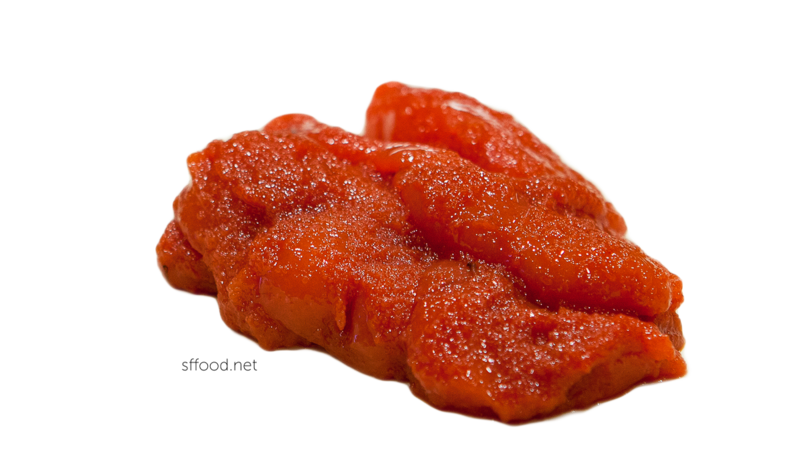 Mentaiko is a marinaded pollack or cod roe. There really isn’t much different which egg it is; the texture and ultimate taste is similar. 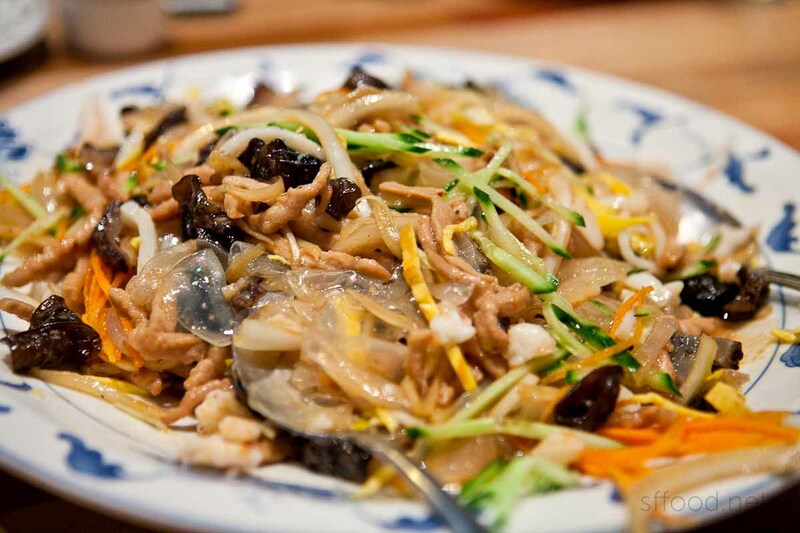 While mentaiko spaghetti is Japanese cooking, mentaiko in and of itself is actually Korean. In Korean, it’s originally called “myeong-nan-jut” (명란젓) and every Korean has had it at one time or another. It’s expensive and considered a real delicacy in Korea. 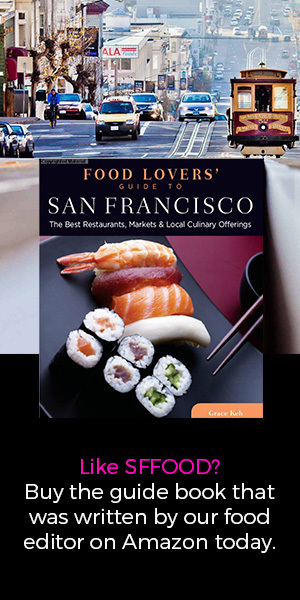 It’s said that sometime in the 50s, this particular dish was adopted by the Japanese and some of the marinade and flavoring was changed to make what is known today as mentaiko. To say this is fishy is an understatement. But it’s not a vile type of fishiness; it’s a strong and pure, clean fishy taste that is inherent to the pollack roe. The seasoning is salty and spicy — meant to enhance that flavor. As roe is naturally an unattractive beige color, it’s also colored in the process of seasoning. Obviously, red roe is a whole lot more appealing than an off-white and beige, dead-looking mashed roe, right? In Korean cooking, we slice this up and pour sesame oil, sesame seeds and green onions on top – or mash it up, sheath and all, with the same ingredients. 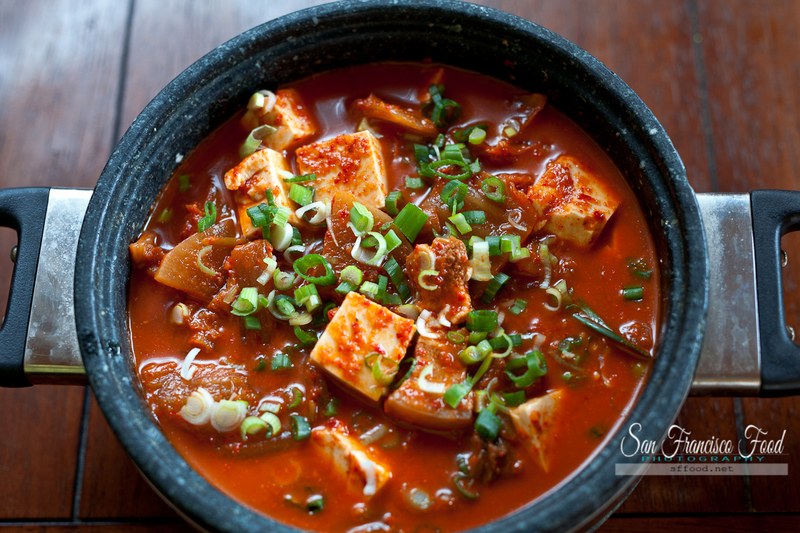 We also have a spicy stew we can make with it. But there’s very little in Korean cooking that goes better with rice than this. 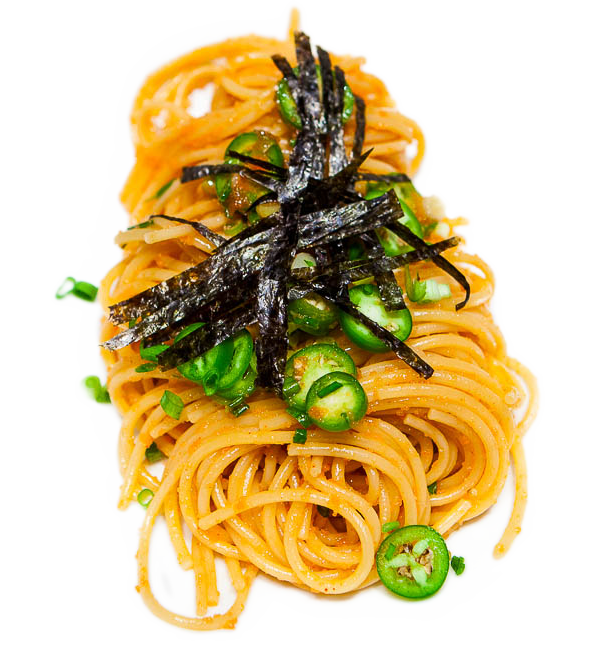 The way the roe is used in this Japanese mentaiko spaghetti recipe is much like bottarga is used in Italian pasta recipes. 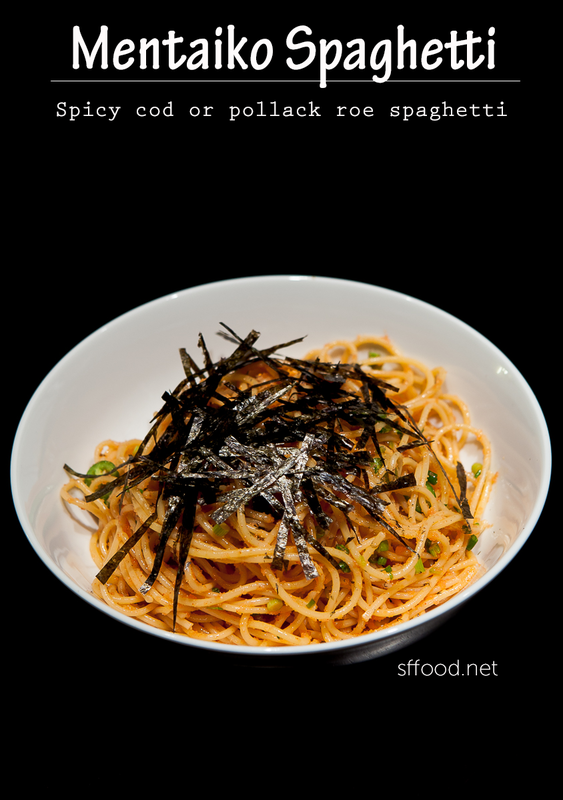 The way the roe is used in this Japanese mentaiko spaghetti recipe is much like bottarga is used in Italian pasta recipes. While this is significantly less fishier than the cured bottarga, it offers a strangely delicious metallic note on the palate when you eat pollack roe. I can’t explain it; you have to try it yourself. This is the world’s easiest mentaiko spaghetti recipe. Depending on who you ask, the recipe can have slight variations, but this is how I’ve made it for years. It takes all of 20 minutes to put it together and is one of those dishes that you could easily make in one pan. The only hard part about this recipe is finding mentaiko. If you have a Korean or Japanese grocery store, it’s almost guaranteed that they will have this, regardless of what it’s actually called. Show them this photo and they will know. 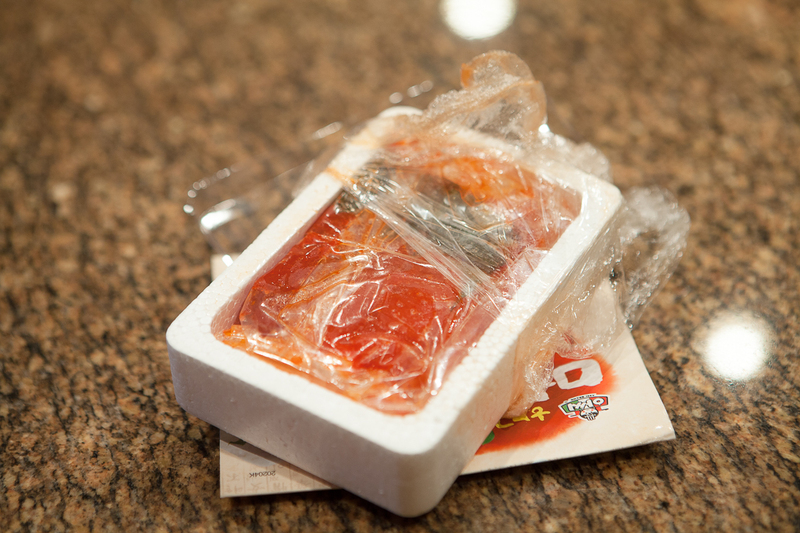 In Korean markets, since it’s an expensive item that does spoil — it’s usually sold in the freezer section near the frozen seafood or frozen foods. Each is QUITE expensive. 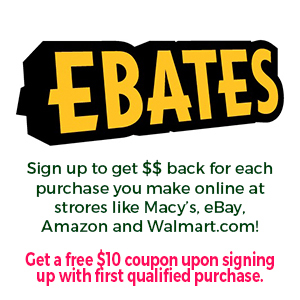 A package like the one above is around $10-13 — and I chose a cheap one because I know this brand and have bought it many times in the past. 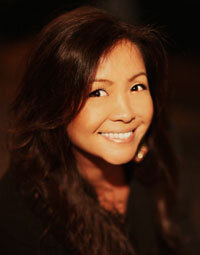 But generally, there will be about 3-5 different brands and some will be over $30 for a slightly larger package. 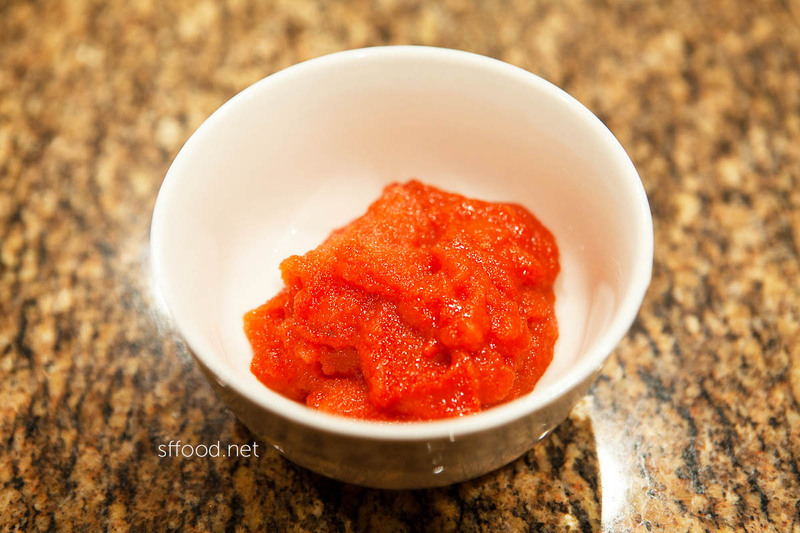 Generally speaking, with this particular seasoned roe, the pricier it is, the better it actually will be. That said — for the purpose of this mentaiko spaghetti recipe, you don’t need to invest in a really expensive pollack roe. The only time I’ll buy the pricey ones is when I’m having company over and serving it as ban-chan. 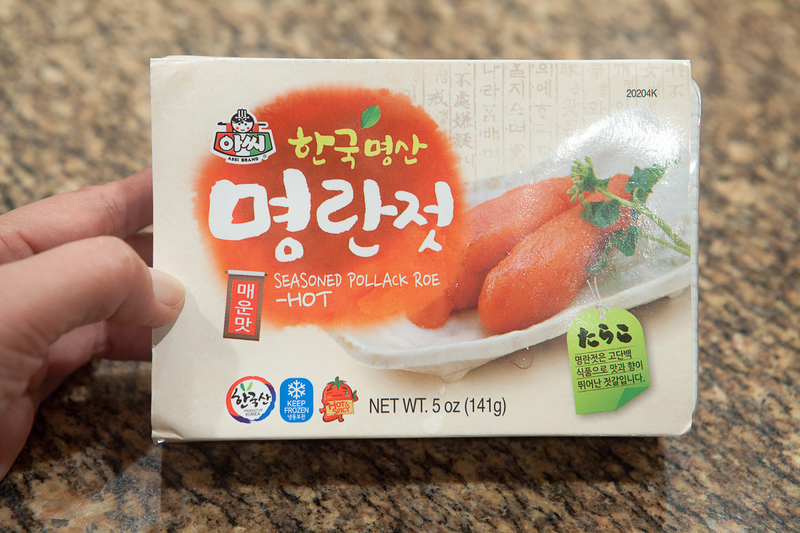 It’s usually four “packs” of roe — no longer than a finger but quite fat. In this package’s case, it was three full packages with one rather mashed up piece. 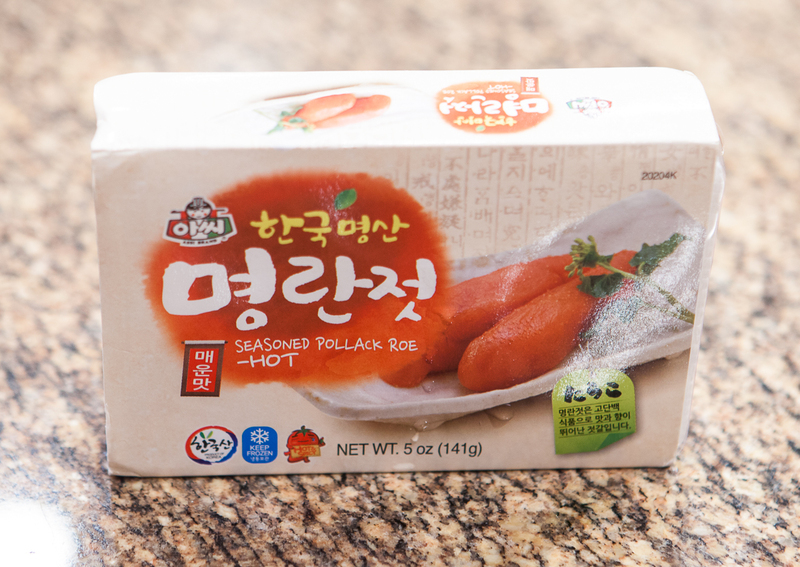 The color was nice and bright red/orange, and tasting it, I could tell it was the right amount of saltiness, which is what I expect from Asshi pollack roe — the brand I bought. 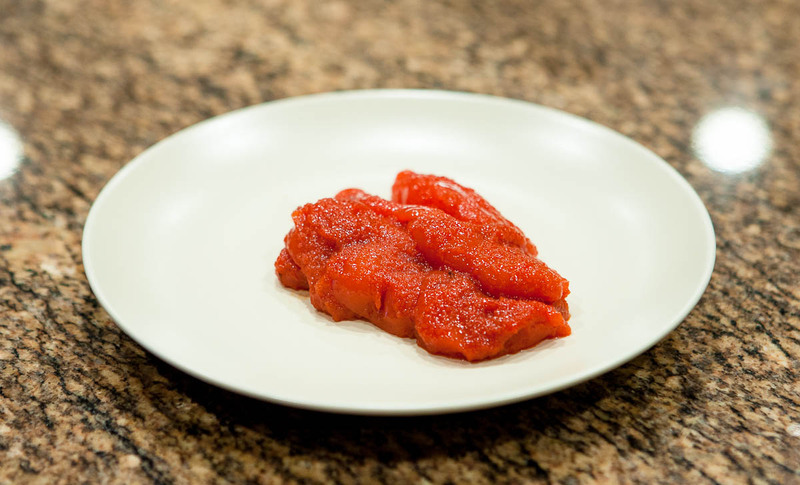 The thing about this roe is that you can easily keep it frozen and store it for up to around 6 months without any alteration in taste. Simply defrost it in the refrigerator for a day and it’s ready to cook with, or if you’re in more of a pinch, leave it out for a few hours opened, and it’ll be defrosted in no time. In my life, there are many occasions where I have about 2 hours’ notice to having guests over — and this has saved me on more than one occasion. While it’s not a fancy dish, nor is it on that shows you put a lot of effort into dinner, it is one that is rich and absolutely delicious — which will at least make your guests FEEL like you slaved over dinner. 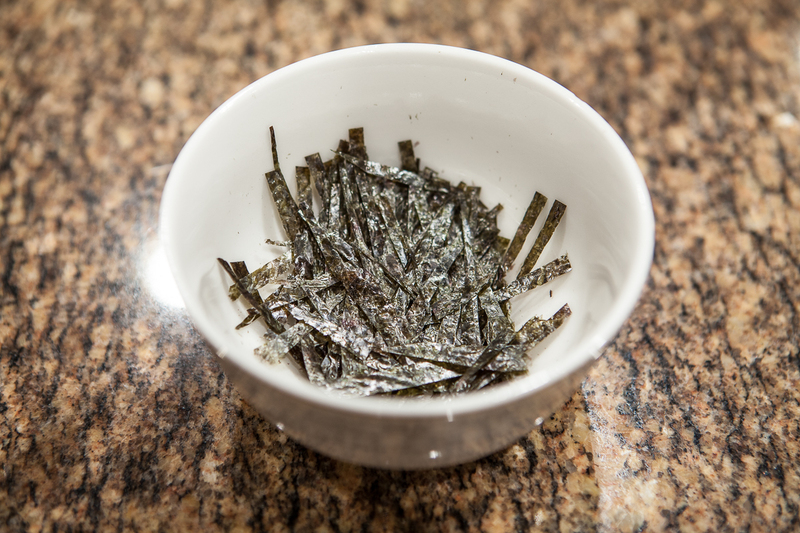 And let’s not even get started on how good it tastes with some roasted seaweed. For this mentaiko spaghetti recipe, we’re using the whole package for about 3-4 servings of pasta, but this will vary depending on how salty you like things. For this next step, you’ll have to use your hands — always fun! We’re going to squeeze out the inside from the sheaths — which are perfectly edible but it’s not as “mixable” in pasta with the sheaths on. With intact roe packs, I usually cut it nicely in half and squeeze out the inside goodness from each end. For this package, I got it out any which way it would come out — and do your best to get out as much as possible! That’s expensive caviar you’re handling there. Not the prettiest photo in the world but you see the sheaths to the left and the inside goodness to the right. BUT WAIT – DON’T THROW THEM OUT! Why, yes… I did have a snack while I was cooking dinner. Now put aside the roe you squeezed out. This is usually about when I start boiling water for the pasta. For the pasta, you want to keep it al dente as possible — and you’ll see why later. And for this dish, I rarely salt the water — as more often than not, I am teeter tottering on it being too salty. Ordinarily, if I had prepped to make this dish, I’d have shiso on hand as well as some daikon radish sprouts along with the serrano peppers. 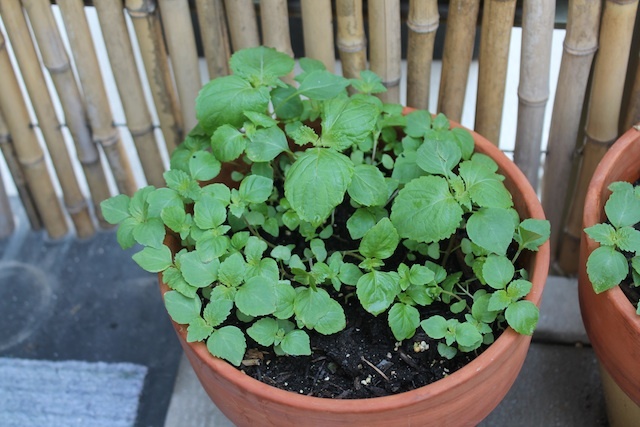 It’s rare that I don’t have shiso on-hand, and in bulk, no less, but having just moved, they’re all little plants right now — and I’d need to head them all off to make enough for this dish. What also works is chrysathemum leaves, and those, too are merely seedlings right now. I don’t even know if they’ll make enough leaves to use before the winter chill hits them, but we’ll see. So I left those two things out and included green onions instead, which I may or may not use when normally making this mentaiko spaghetti recipe. At this point, the pasta should be ready. I keep this quite al dente because I am actually going to let them cool quite a bit without washing them in cold water. As I am pouring the roe into this pan, if it’s too hot, it’s going to cook. Now, mind you, the roe tastes wonderful cooked, too — but that can’t happen for this dish or it starts getting gritty in texture because of the cooked roe. For this mentaiko spaghetti recipe, we’ll be letting the pasta cool down for about 5 minutes total — just enough to not cook the roe. While you’re waiting, add 2T of unsalted butter into the noodles along with a tablespoon of extra virgin olive oil, then stir it all into the noodles. The stirring process will also help to cool down the noodles faster — but the oil actually helps spread the roe later to keep it from clumping onto pasta here and there, not to mention the great added flavor. Now, the noodles are nice and shiny — and even as they cool down, they won’t stick together or get too starchy. At this point, I also toss in the other ingredients — in this case, the green onions and serrano peppers — but keep some on the side to garnish the dish, if you’d like. Stir again — and before you know it, five minutes have gone by and you’re ready to add the roe. In this case, I’ve made about 3/4 of a regular pack of pasta. The box may say 8 servings — but let’s be real — a full pack is good for about 4-5 people with average appetites! So about 3/4 of a box is good for 3-4 people. Remember, I had 4 packs of roe in that box — and all of it was squeezed out. When adding the roe, it’s best to do a little at a time. The entire amount of roe may or may not be salty enough, depending on the brand and batch, too. 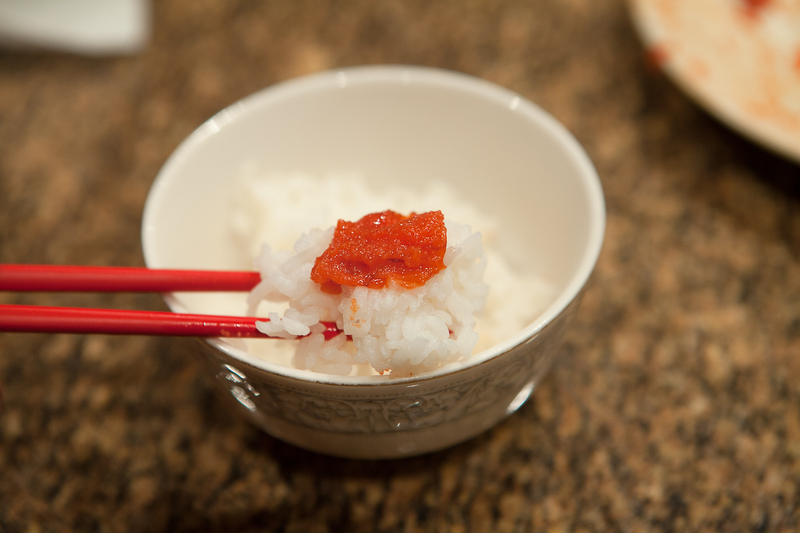 So add a heaping spoonful of roe and stir in, then taste — and add more, as necessary. In my case, without adding one bit of salt in this whole process, I used all four roe packs (after tossing in the first 3/4 first) and it was salty and spicy — just the way I like it. 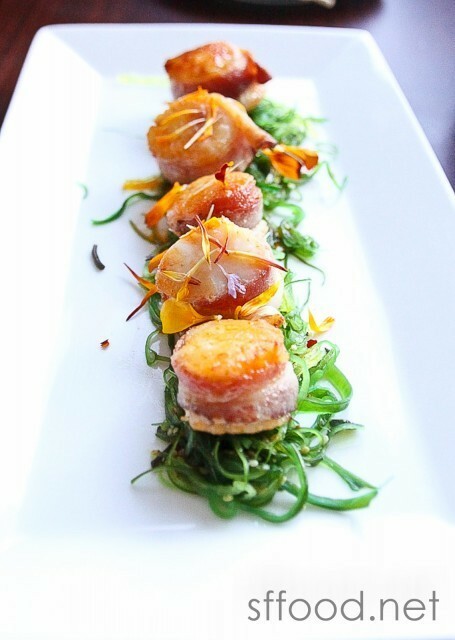 Serve onto a plate immediately, as it’s already cooled down, and garnish with the leftover ingredients and toss on the seaweed for flavor and contrast. You’ll see — each bite is a great combination of starch from the noodles with a truly unique fish flavor from the roe — combined with the creaminess from the butter and oil. They are completely separate flavors that combine into one gorgeous symphony. As of late, folks keep telling me I like “pretty food”. I’ve shown you a dainty, pretty little bowl of spaghetti. That’s more like it. Who eats that little twirl of pasta and calls it a day? Forgot to include the recipe panel! A delicious and unique spaghetti dish - popular in Japan and Hawaii - is really easy to make at home. If you like fish, bottarga or even caviar -- this dish is for you. ½ C of cream can be added directly to the roe if feeding palates that aren't used to roe; you will probably need to add a little salt; go bit by bit, tasting each time. Remove roe from the cod or pollack roe "sheaths" and put aside. Boil the pasta -- do not salt. You can add oil, if desired. 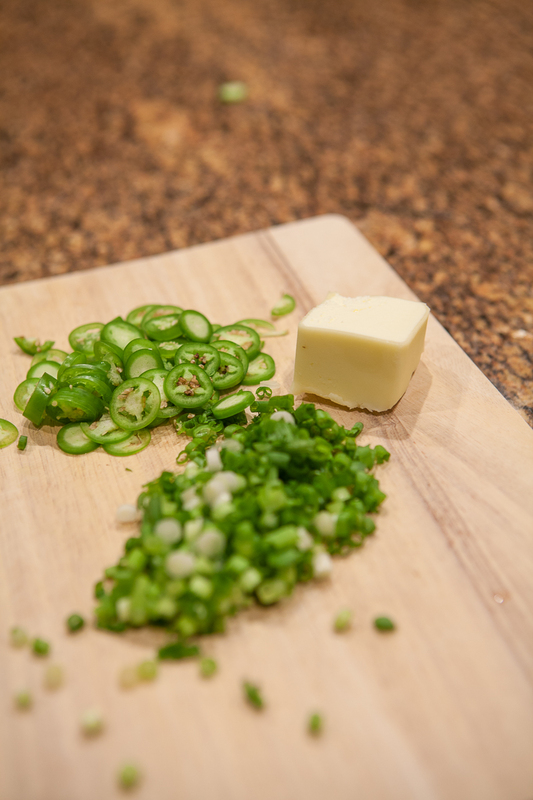 Prepare the garnish items -- like green onions, shiso, daikon sprouts, or peppers. Put the butter into the hot pasta and drizzle about a tablespoon of olive oil. Put ¾ of the prepared garnish into the pasta pot. Drop ½ the roe into the pasta, stir well and taste. If needed, add a little more roe at a time into the pasta until seasoning is perfect. Plate and sprinkle with remaining garnish. If you want to use pepper, sprinkle over the dish now. This will serve about 3 regular appetites, or 4 smaller appetites. If you use the whole box of pasta, nothing else really needs to be increased; you will just use a little more roe. 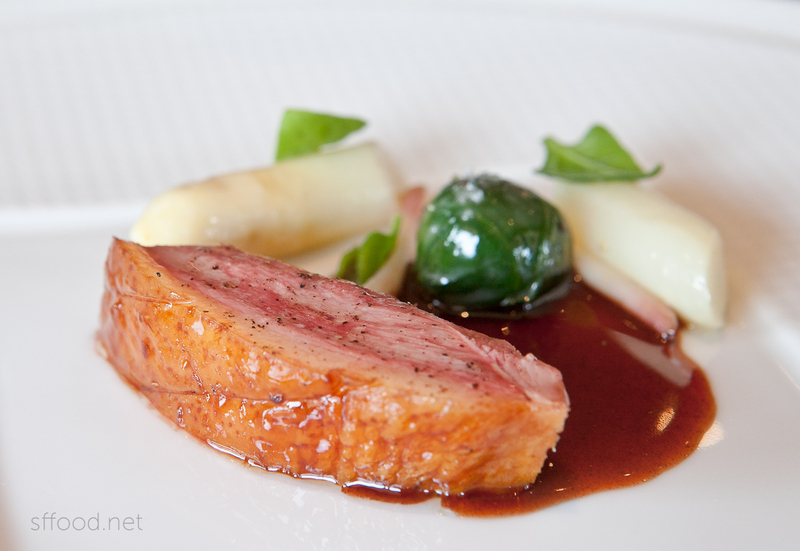 This is a dish I never had, how long has it been popular. Y ahora lukas comiendo pasta sin trigo aprovecha tio bello.